It's taken nearly 2,000 years, but regular folks will soon get to feel what it is like to walk on water. This is thanks to a project by the artist Christo. He may or may not have had his namesake in mind when envisioning his latest project. It's titled, "The Floating Piers." "Any interpretation is legitimate," Christo, 80, allowed graciously. He spoke in an interview with The Associated Press. He was at the picturesque Lake Iseo. It is in northern Italy. It is where his 23rd large-scale installation is about to open. Since November, Christo and his team have been overseeing the assembly and anchoring of 220,000 floating polyethylene cubes. They have created a nearly 2-mile undulating runway. It connects the mainland with a pair of islands, one inhabited and towering above the lake. "For the first time, for 16 days, from the 18th of June to July 3, they will walk on the water," Christo said of the 2,000 residents of Monte Isolo. It is normally only accessible by boat. "The Floating Piers" is expected to draw half a million visitors during the longest days of the year to northern Italy's least-known big lake. That is considerably fewer than the 5 million who visited Christo's and his late wife Jeanne-Claude's famous "Wrapped Reichstag" in Berlin in 1995 and the 2 million who walked through their work "The Gates" in New York City's Central Park in 2005. The project still awaits a final touch. It is the application of deep yellow fabric. The artist promises it will dramatically shift from nearly red to brilliant gold under the effects of light and humidity. The project awakens many metaphors. Yellow brick road, for the fantastical journey it beckons. Runway, for the attention it commands. Beach, for the lapping waves along the sloping edges of the more than 50-foot wide boulevard. The fabric, which will be sewn into place by German seamstresses with specially made sewing machines, to create natural ruching. This effect prompts Christo to warn that visitors will have to step carefully along the oscillating platform. The installation opens on June 18. About 150 volunteers, among them lifeguards, will be posted on the piers and on boats to ensure safety. Swimming is forbidden, but expected, despite the cold water temperatures. Entrance is free. The entire cost of the $17 million project was financed by the artist himself. Christo's projects are as much feats of engineering as they are works of art. He has brought in a team of athletes from his native Bulgaria to assemble the specially made, recently invented cubes. Divers anchor them to concrete slabs on the lake-floor. The 190 anchors were moved into place by air balloons. Like many of his previous installations, "The Floating Piers," had its own destiny. Christo and Jeanne-Claude, who died in 2009, envisioned it for the delta of Rio de la Plata, Argentina, in 1970. But they failed to get permissions. They then considered Tokyo Bay, but again failed to get the permits. "The project is done for ourselves. And if other people like it, it's almost a bonus, very much like a painter who (has) huge big canvases they like to fill it with color. You don't fill the canvas with color to please Mr. Smith, Mr. Jones. You fill it with color because you like to have the joy to see this color," Christo said. 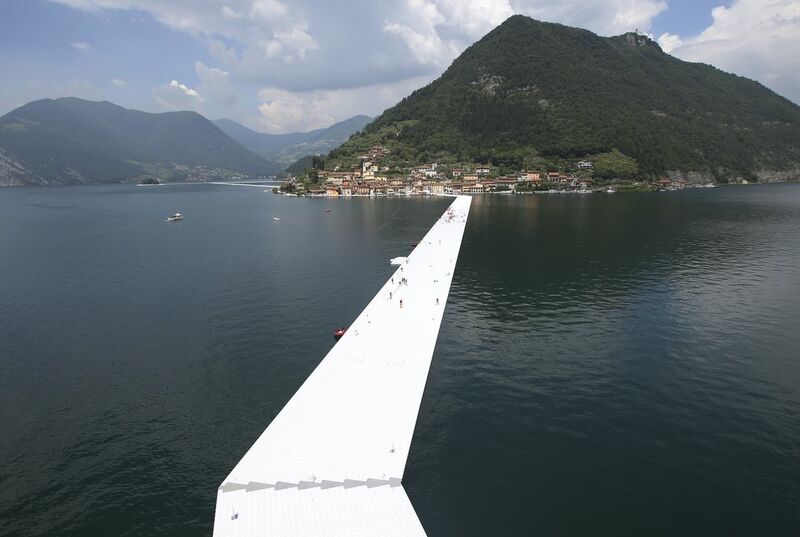 When his 80th birthday was bearing down on him, Christo decided to make another run at "The Floating Piers." He chose Lake Iseo for its calm waters and simple shoreline against the majestic Alpine foothills. Some believe they may have inspired the background of Leonardo's "Mona Lisa." The installation physically draws in visitors. It demands their participation to get the full experience. That's by the artist's design. "I don't like to talk on the telephone. I like to see the real people. And of course I don't understand anything of computers. I like to have the real things, the real water, the real sun, the real kilometer, the real wind, the real fear, the real joy," he said. Christo delighted in the gentle movement of the nearly finished project. He instructed a boat driver to circle past the runway to create waves and smiled gleefully at the gentile oscillation of the platform. Had the original project gone through, it would have been built with stodgier pontoons. But they lack the kinetic grace allowed by the recently invented cubes. Why does the installation remind people of other things? 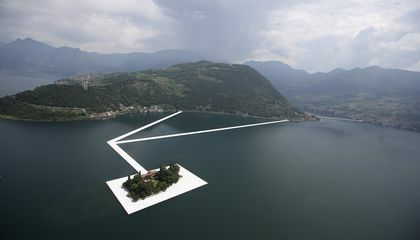 The people would be able to feel how it is to be walking on water that an artist had been able to install in northern Italy's least-known lake to draw attention to visitors. The Floating Pier would be able to get visitors how they feel when they are walking on water on the lake. The artist had been able to get in the idea to make the project of The Floating Pier that he had been able to make. The people would be able to walk on the project that the artist had been able to make the least-known lake which people would be able to see the tourist attraction of The Floating Pier. Critical Thinking Question: Why does the installation remind people of other things? Answer: I know that the installation would remind people of other things because the installation would be like building their dream that they always wanted in their life. It is amazing that they get to walk on water. But actually, I don't think that they are really doing that. I think that they just built some sort of bridge thing that they could walk on that is really low and really close to the water. But I think that it looks dangerous. I think so because I think that sharks might come up or other stuff. But by looking at the image in the article it looks like that people really enjoy walking on a bridge and also that people imagine that they are walking on water. But it would be cool if one day a perosn invented some boots that allowed you to walk on water. I wish that one day a person will invent such thing and let me actually walk on water. It is amazing that you will be able to experience this. It is a very smart idea to use polyethylene cubes. It would be a very realistic experience. This is very helpful to society today. People are always on technology now. People can't experience this with technology. They have to go out and experience this. They will also have fun experiencing this. I hope that I will get to go to this and experience this amazing creation. Critical Thinking Question Answer: The installation might remind people of other things because they might experience this and remember somethin like it. Christo's art invention is very beautiful. It's sad that his wife did not get to see creation and final product of their vision, but I'm glad Christo still found a way to complete their dream. I love Christo's philosophy concerning his art, that he does what makes him happy and if other people like it as well that's a bonus. The installation reminds people of other things because it has a yellow carpet. Yellow carpet,yellow brick road, it reminds people of the yellow brick road from The Wizard of Oz. Yellow also represents happiness.When you are on the floating pier and the water is underneath you, it is like you are on a whale's back. The artist who created this walkway made it so that it feels like the people are walking on top of water. This is so great, I would love to go and walk across this. I love how the creator of this piece of art said the interpretation of this piece is up to ones decision. It could be anything from the Wizard of OZ, like the article said, or it could even be achieving your life long dream by walking down this path. The idea itself is amazing and the invention of the cubes is simply fantastic. It really tells you about the person who made the art and what goes on in their head. The design of the yellow fabric that changes color Is very imaginative. A floating pier sounds awesome and i love to go to a floating pier, it would be awesome to experience what it feels like to walk on Walter. A artist named, Christo is constructing a structure that allows many people to walk on water. This structure is called, " The Floating Piers." The structure is taking about 2,000 years to be built. "From June 18th to July 3rd, people will be able to walk on water", says Christo.